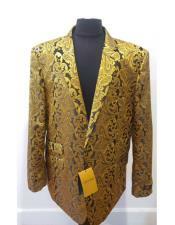 Gold is a color for traditional and auspicious occasions. 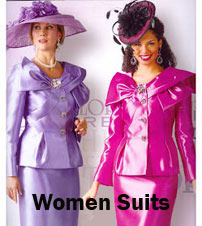 But this has turned out to be a myth that many men don't follow. 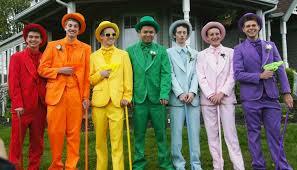 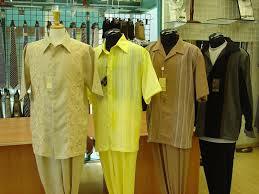 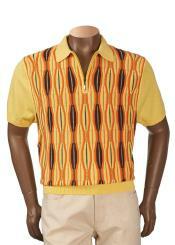 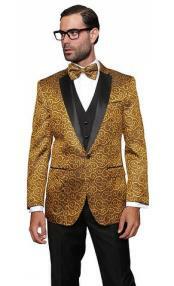 The gold color is now worn for many formal as well as informal occasions. 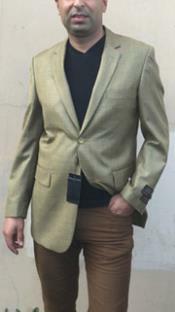 Men choose to pair the color gold with other colors that blend well with the shade and adorn a classic and stylish look in gold colored garments. 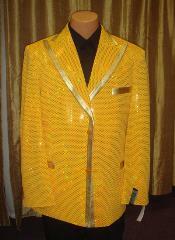 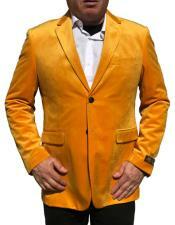 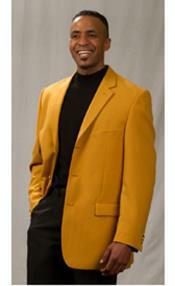 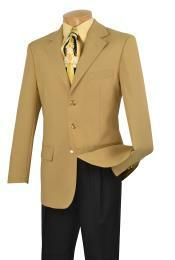 Gold blazer for men is a fast moving product that many men are interested in, these days. 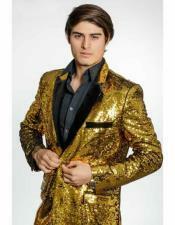 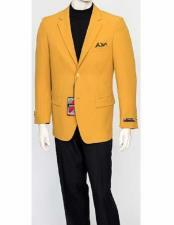 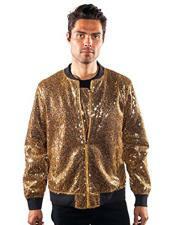 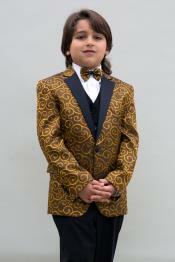 Mens gold blazers come in all styles and design that are suitable for all types of occasions. 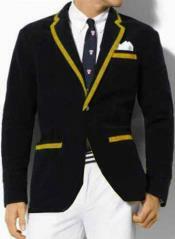 A gold blazer can be worn for a formal business outing when it is paired with a sophisticated white color. 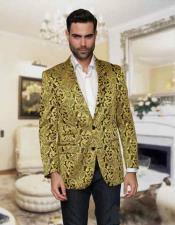 White and gold blazer for men has become a popular and trending choice that many men prefer to wear these days. 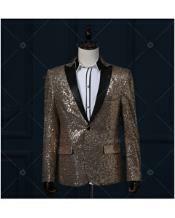 These gold and white blazers for men come in shiny sequin patterns, paisley print patterns, and plaid checkered patterns and so on. 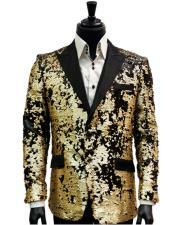 With so many different designs and patterns to choose from, these gold blazers are a must have for men in their wardrobes. 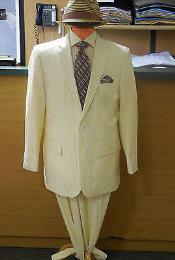 Men's suits are also designed in the white and gold combination, making it ideal for formal men's wear. 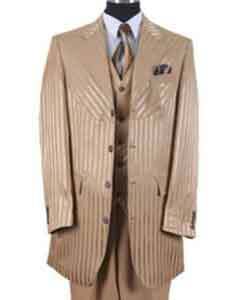 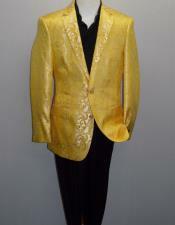 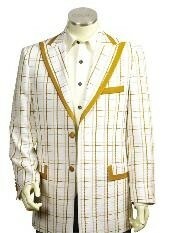 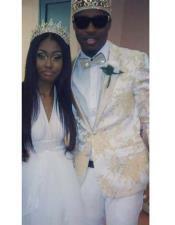 The white and gold suit jacket looks simply elegant and ideal for beach side wedding occasions and church weddings too. 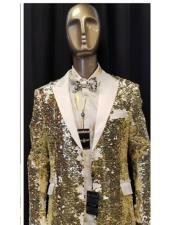 If you are looking for groom suits, you can consider the white and gold tuxedo jacket, paired with a crisp dress shirt that makes the overall look of the groom classic, simple yet stylish. 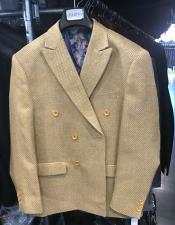 While white looks simple and sober for formal occasions with gold men's blazers, there is yet another trending color combination with men's gold suits and blazers. 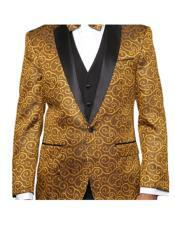 The black and gold blazer for men is yet another trending choice that men prefer off late. 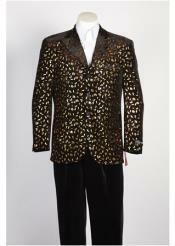 The dark and bright combination with black and gold blazers for men is suitable for auspicious evening and night time occasions that highlights and enhances the look of the colors. 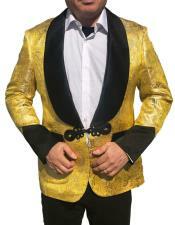 If you are a night party person and want to make your look attractive and noticeable, then you can simply go for the plain gold dinner jacket that will suit your choice of taste. 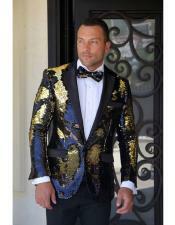 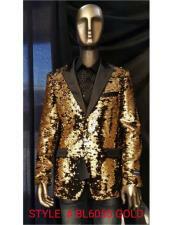 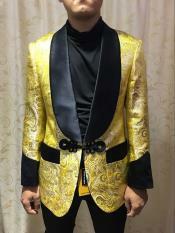 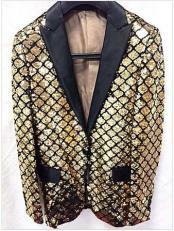 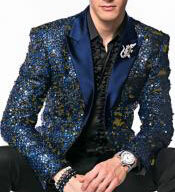 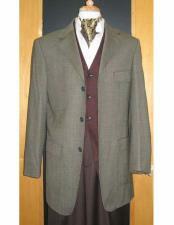 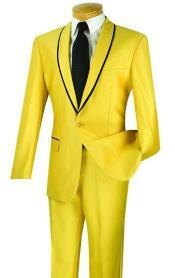 Mensusa stocks amazing collection of men's gold blazers, suits and dinner jackets. Buy gold blazers, gold suits and gold tuxedos for men from varied patterns and latest designs available at amazing discounts and prices. 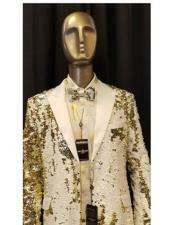 Browse this category and find the best collection of men's gold suits, blazers, dinner jackets with black and white combinations. 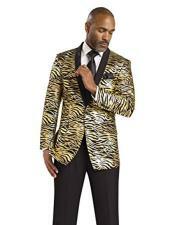 Also shop for matching accessories for your gold and white suit, shop for matching dress shirt for black and gold dinner jacket and find some classic cuff links for all gold dinner jackets for men exclusively at our online store for men.